Max Mason (III) grew up in Lincoln, Massachusettes. After graduating from Vassar College with a degree in Geology in 1975 he came to Philadelphia to study at the University of Pennsylvania with Neil Welliver in 1981. He is represented by the Gross McCleaf Gallery where he has shown his landscape, still life and baseball paintings since 1985. He has painted several murals for the Philadelphia Mural Arts Program, and recently completed a 10’x 160’ mural, “Pennsylvania Agriculture”, for the State Farm Show Complex in Harrisburg, A life long baseball fan, he began painting baseball subjects at Penn and had a one person show of baseball paintings at the Butler Institute of American Art in 1991. He was commissioned by the Phillies to paint three 10’x 30’ murals of Philadelphia baseball stadiums for Citizens Bank Park. 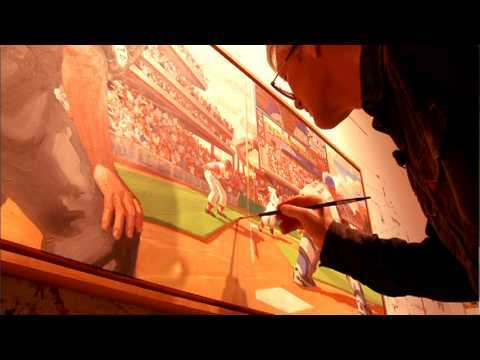 In 2010 he started The BallPark Project, an endevour to paint large, dynamic, fan oriented paintings of all 30 Major League Baseball ball parks. He blogs about his travels, the creation of the paintings and the ball parks themselves at maxmasonartist/blog.com.